I love when skincare brands make it easy to find products perfectly suited to my skin. 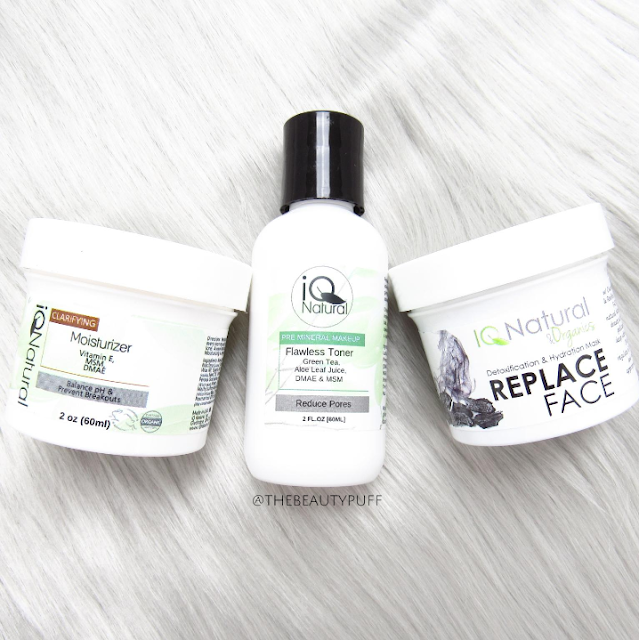 IQ Natural has an entire line broken down into categories to take the guess work out of choosing the right products for your skin type. Whether you have dry, sensitive, mature or oily skin, they've got your perfect match. Clarifying Moisturizer | This moisturizer soothes skin while it fights breakouts. It's a great mix of hydration and treatment without irritating the skin or feeling heavy. The formula is actually quite light and is well suited to daytime and nighttime use. Key ingredients include aloe, coconut oil, jojoba seed oil, avocado oil and vitamin E.
Flawless Toner | Packed with skin-loving ingredients such as green tea, aloe and tea tree oil, this toner clarifies, tightens and evens out skin for a smooth complexion. It feels very soothing and never makes my skin red like a typical alcohol based toner might. Plus, I haven't had one breakout since I started using it, love! Charcoal Detox Mask | Active charcoal works wonders for oily skin so I gravitated toward this mask right away. I get clear skin with the benefit of added hyaluronic acid for extra hydration so skin is left clean and smooth. The formula is like a thin lotion and doesn't dry on the skin so it's very comfortable to use. It only takes ten minutes for this mask to work so you can enjoy it any night of the week. I love how it detoxifies my skin without making it feel parched after I rinse it off. I follow this mask with my toner and moisturizer and my skincare regimen is complete! The IQ Natural Skincare line is comprised of natural and organic ingredients that are gentle enough even for the most sensitive skin. You can shop by product type, or by skin concern on their website below.